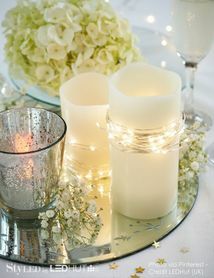 Our wonderful new super bright PURE WHITE LED light pucks are perfect for using in our chandeliers! For installations where you really can't use the plug-in light kit, simply place one of our light pucks! They conveniently fit on top of our acrylic chandeliers! Item # 135561250: Pure White (You are on the page to order this Pure White color) = cool tone, almost light blue like LED headlights on many newer cars. Additional Features: Extra carabiner for convenient usage, Portable and easy to mount, LED's minimum of 50,000 hours of use! There is a strong hold magnet on the back side also which help hold it in place if mounted underneath of another magnetic object! Cordless with Remote Control! Remote has approximately a 30 Foot Range! This unit is NEW AND IMPROVED! We have just added an Infrared Remote control. In the past, the remotes worked on radio frequency so that if you had several of these light disks, one remote would turn one or more on and off (and generally drive you nuts until you got it set correctly!). Now, the infrared operated remote allows you to aim your remote at one lamp at a time and turn it on and off (and set the functions too). This is really handy when you have a lot of LED lighting in one venue. 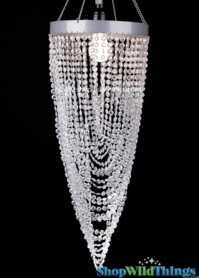 The photo below shows our AMELIA 4' Long Chandelier with an LED Light Saucer placed in the center of the top. 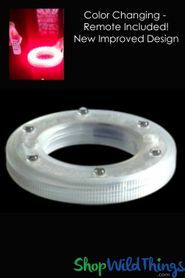 Instead of using the light kits that most of our chandeliers come with, you can use this disc! It looks FABULOUS! If you have a question about whether the chandeliers you are ordering can be used with these LED Light Saucers, please don't hesitate to call us. We will check it out for you! You will get one saucer with 23 LED's on it. Merchant Response:Beautiful! Thank you so very much! The chandelier bought elegance to the gazebo and mom loves it. Great product for many applications ! I purchased two of your chandeliers ,a small 10'' and a large 24'' round one. I first purchased 2 warm white and thought they didn't throw as much light as I wanted.I purchased two of the cool white and they are much brighter for my applications . ProsFits beautifully on the bigger chandelier and provided the amount of light I wanted ! ConsIt doesn't quite fit the smaller chandelier ,wobbles and does not sit flat ,but it's up high and you don't really notice ! I just wonder why they don't fit all the sizes and the rings on the top of all your hanging chandeliers! This light is perfect for a chandelier. It works well with the April chandelier and fits right on top. I plan to use them to light up the crystal hurricane vase. They aren't as bright as I need them to be, but I can all ways use them. Just as described. Used on top of chandelier and wow! Perfect for a place where electric connections are not possible. Merchant Response:Thank you so much for your comments! We love the LED Light Saucers and the versatility they provide. Performs great! Very happy.Looking for aplace to use another. 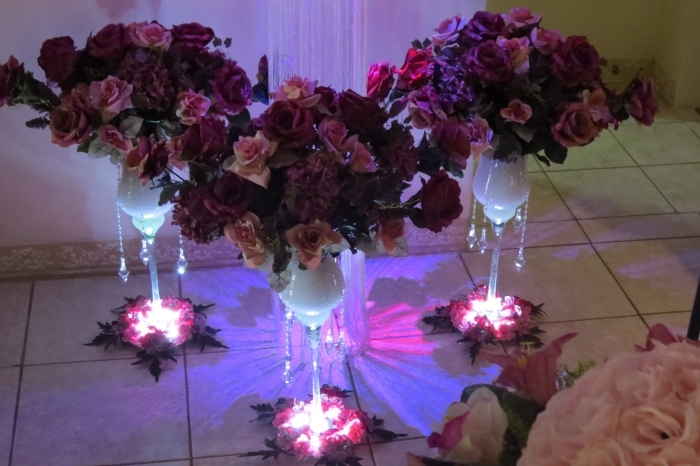 This LED saucer with remote is great light source, especially when you have multiple centerpieces to high light. I just wish it came in multiple colors. Wish it were brighter, but the fact that it has two settings and can be controlled remotely is awesome! ProsWish it were brighter, but the fact that it has two settings and can be controlled remotely is awesome! ConsWish it were brighter, but the fact that it has two settings and can be controlled remotely is awesome! Excellent need to purchase more. 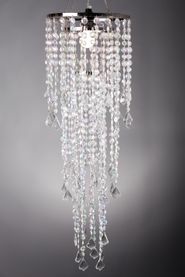 I love these lights an excellent addition to my chandeliers and perfect fit. Neat little remote controlled light. Has a magnet to easily attach it to the chandelier. Remote controls are a little confusing but you'll figure it out. Highly recconmmended with any of their movaeable chandliers. No ugly cords to ruin the beauty of the light. Perfect amount of brightness. 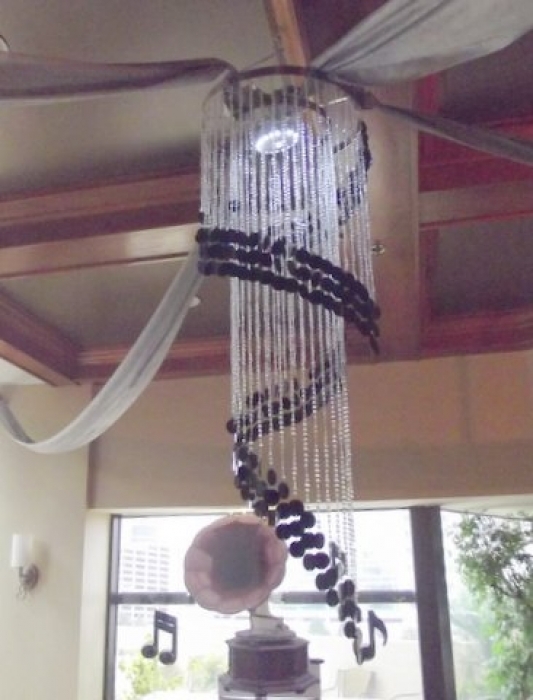 ConsMagnet is in the center of the light but slide to the side on the chandelier. Not noticeable when installed but still a slight design flaw. I still reccommend this product though. Awesome LED Light Saucers for Chandeliers! 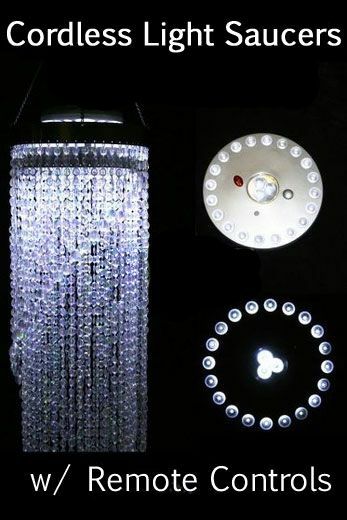 I ordered 2 LED Light Saucers to accompany 2 chandeliers that I purchased. The LED Light Saucers are great and I strongly recommend this item. Both of the LED Light Saucers worked fine. My only complaint is that the remote for one of the LED Light Saucers did not work at all. As of now, this product is out of stock, but I would like to order more. ProsGreat addition to my chandeliers!! Very good investment. Lights are very bright or dim depending what you wish to set it at. The remote control was very helpful in allowing me to setup the entire chandelier and not need a step stool to turn it on and off. The light is wonderful! You have the option of setting it to three different settings 23 lights, 20 lights, or 3 lights. Perfect for any light situation you need. Their customer service is excellent. They were wonderful assisting me with my order! Haven't used them for an event yet. But played with them to see how they worked. And found them to be very easy to use. ProsEasy to use and like the many ways to install. Also LOVE the remote. This thing is awsome. 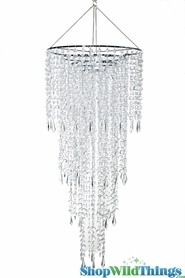 Make my chandelier look 10 time more expensive and awsome, everyone loves it, and I love having the remote it is so easy to turn the light on, off or dim. Customer Service is also awsome if you have any questions or problems they are happy to help you. Love this company and their products. Excellent product, easy to use, well priced. 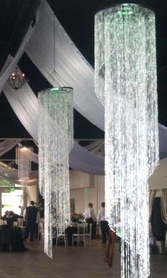 Really makes party chandeliers come alive without the effort of using extension cords. The remote control is really handy too! I am having a destination wedding in Ocho Rios Jamaica and am attempting to add some of my personal touches. What I love about this light is - it's bright and fits perfectly on top of my chandelier. My fiancé loves using the remote control to make the light dim, bright or turn it off completely. I would highly recommend! 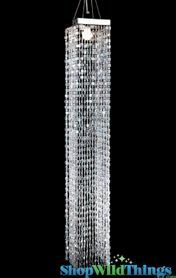 We purchased four of these to go on top of our table top chandeliers. ProsSuper bright, when dim, it's cozy, the remote control makes it convenient to use and it will be easy for us to pack in the luggage as it is flat. The lighting enhanced the already beautiful chandeliers. Very bright nice item with two settings and remote control. ProsRemote controlled-no climbing ladders to turn on the lights. Just point the remote and click. Lighting has strong magnet and small handle to hang. Very easy to use. Add batteries and you are set! The LED Light Saucer is very easy to work with. ProsThe LED Light Saucer put out a lot of lighting and that is what we were looking for. First, I really like the remote control the the 3 options of lights, it's battery operated is why I purchased for outside wedding with no outlets. Also, to my delight there is a battery on top of unit to keep it in place, however this will not be used this time around with chandelier I will be applying to. Nice investment at a great price. View submitted photo: The saucer is on top shining down and I also purchased battery operated string lights to hang further down the chandelier for added "glitter". Photo is just a demo, not the event for purchase photo yet. String lights are Great! application.! ConsFor my application I could use stronger lighting. This is cool! 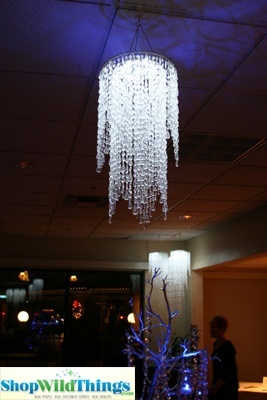 What a great tool to have for lighting up chandeliers or beaded curtains. the remote control is key! bought this to go with the chandelier I got for my daughters room....love it...no cords, and she can turn it on/off easily. I loved this product I will by alot more of again soon for my lighting projects. Easy to install and use at the top of the chandelier I purchased for my teenagers room. Very pretty.